Alicia Dwyer, a filmmaker from Los Angeles who has directed, edited and produced an Academy award winning documentary and an Emmy-award winning series, recently travelled to Ohio not to film a documentary but to direct and produce advertisements. She produced ads for Local Voices for Obama, an innovative campaign to broadcast local ads featuring local voices and attitudes in swing states. LAist sat down to talk to Alicia Dwyer about her experience. LAist: How did you get connected to Local Voices for Obama? Alicia Dwyer: Well, I’d first signed up to go to Nevada, to volunteer for the Obama campaign’s efforts. But I had also put out some feelers to other documentary makers to see if anybody knew if there were media needs. I’ve been making documentaries for the last twelve years, and my brother and I have a small production company in Los Angeles, so we wanted to see how we could best contribute, using our skills. Rory Kennedy, who I worked with on the feature film Pandemic: Facing AIDS, connected me to Lee Hirsch, an Emmy-award winning filmmaker based in New York who’s the visionary behind Local Voices for Obama. It was Lee’s idea to make ads featuring people in swing states who were voting for Obama, who might speak to values and issues that undecided voters in those communities connected to. At the time Lee and I started talking, he was producing such commercials in southeastern Missouri, a deep red part of the state. My brothers and I often work together, and we inherited the hope that, as MLK said, the arc of the moral universe is long, but it bends towards justice. So, when the idea of going to Ohio to shoot Local Voices ads came up, we jumped on it — I produced and directed, my brother Michael shot the ads, and my brother Jesse did the sound for them. LAist: So how does Local Voices for Obama work? Alicia Dwyer: Lee Hirsch and Local Voices for Obama had hooked up with a group called Truth and Hope. Eugene Hedlund, the founder of Truth and Hope had figured out in 2004, during the Howard Dean campaign how to get local ad buys for cheap -- and how to do cable buys that would target undecided voters in these areas for as low as $35 to $45 for an ad. Neither Truth and Hope nor Local Voices for Obama are paid for or are a part of the Obama for America campaign. Three of us directed, filmed, and produced Local Voices ads in three different states – Lee Hirsch in Missouri; John Allen in Nevada; and myself in Ohio. We filmed local people speaking thoughtfully about why they have decided to vote for Obama, which we hope will be useful to their undecided neighbors. We wanted to film them locally and then broadcast them locally -- our documentary instincts told us that the best people to speak to the issues of voters in battleground counties are local people themselves. LAist: So tell us about the ads. Alicia Dwyer: So, the first ad that went on the air was one by Lee Hirsch, and it featured Dana Snodgrass, an auto repair shop owner in Joplin, Missouri. Joplin is a very conservative town in southeastern Missouri. Snodgrass is a respected community member there. He spoke from his heart about why he’s voting for Obama. It really seemed to give the community a jolt. In one week of running Local Voices ads in Joplin, a city of 50,000 in southwest Missouri, a coalition came together within the city: they called themselves The Secret Society of Joplin Democrats. They pledged that for every negative call or email response to a Local Voices ad, they would match with dollars to run the ad again, meeting intimidation with action (and it only costs around $40 to run the ad again). They really galvanized the community, and ended up actually funding the ad themselves. This has brought major local media attention, including a front page spot in the Joplin Globe (which publishes daily and circulates in more than 90 communities in 14 counties). So it has already had an interesting effect in Missouri. LAist: You and your brothers shot, directed and produced two of the Local Voices ads in Ohio -- one featuring a decorated veteran named Barclay and another featurning a small business owner named Joan. Tell us about the process you went through. Alicia Dwyer: Well, my friend Katie Roper had gone to Ohio to work to get Obama elected there (but not directly working with the Obama campaign). I was excited that she had dropped everything to do this, because I knew that Ohio had been so crucial to Kerry&apos;s loss in &apos;04, and that in some counties he had lost by only nine votes or thereabouts. Katie had been talking to undecided voters every day for about three weeks at that point, and we decided a Local Voices ad campaign would be great to do there. We decided to fly to Columbus, right in the middle of the state of Ohio. Columbus is a city where the city itself may go blue, but the towns immediately around it are deep red. We sent an email to our friends and contacts, and we received frequent flyer miles and money for our trip to Ohio. When I got on the plane to Ohio I was really nervous. People had donated the equivalents of trips to Europe in frequent flyer miles. I asked myself -- who am I going to find, and are we going to do something that will be worth all this effort and contribution? I was reassured by Lee Hirsch’s words. He had told me – two weeks ago we had nothing – now we have the Secret Society of Democrats in Joplin! And things ended up coming together quickly. I spent an entire day talking to 75 people – emailing and on the phone, telling them what I was doing. People connected me to more people. My brothers arrived for the weekend and we shot five different local voices and sometimes their families in the Columbus and Mansfield, Ohio areas. Michael did camera and donated his equipment, and Jesse did sound and donated his equipment. They both added great questions. And Jesse really pushed for us to interview a small business owner. The whole Joe the Plumber thing happened in Ohio. Barclay Hastings, who’s featured in one of the videos we shot, is amazing! Somebody recommended that I speak with him. I first talked to his wife Molly on the phone. She said “Oh absolutely he’s out cutting wood right now, but when he comes back I’ll have him call you”. Thirty minutes later, Barclay called me and asked what he could help us with. I explained what we were doing, and he agreed, saying “well, I would do that.” I asked him on the phone, just so that I would have a sense -- I asked why are you voting for Obama? I knew he was a veteran, that he was a marine. He started to speak about Obama, his thoughts about where we are right now, what this country needs. I got chills listening to him. I knew he was someone who had thought about these issues quite deeply. I could also hear this wonderful combination of wisdom, humility and humor. When we went to his house, he and his wife had blueberry pie waiting for us! And he joked to us that he didn’t want to become a Hollywood movie star. Another ad we shot featured Joan, a small business owner in Ohio. There’s a great story behind how we found her. We were staying at a bed and breakfast in Columbus -- it was cheaper than a hotel. The woman who owns it is a McCain/Palin supporter. But there was another guest – a traveling salesman who was a lifelong Republican, and he told us at breakfast that he was voting for Obama. He essentially said -- I don’t agree with some of his policies, but I think we really need to move forward on race relations in this country, and when I see the effect of Obama on young African Americans that I know and see, I feel like that’s such a positive thing. He was really interested in American history and felt that in terms of race in this country, we needed to have a black president and Obama was the one. He said to us, let me get on the phone, let me see what I can do, you want a small business owner. He called up some friends, starting the conversation with “You’re my friend, you’re a liberal.” And he ended up putting us in touch with Joan. After a few days in Ohiowhen we returned home to Los Angeles, an incredible team of people stepped up to volunteer to edit, mix and finish the spots for broadcast, and we are extremely happy that Michael Heldman did such beautiful editing on our Ohio spots! LAist: Are you working on any other ads for Local Voices for Obama? Alicia Dwyer: We shot a third ad, featuring a young woman named Nicole, in Mansfield, Ohio, a rural town. Nicole became passionate about Obama because she watched her grandfather die of cancer and her grandmother go bankrupt afterwards because of medical bills. Her grandpa had fought in WWII and both her grandparents worked hard for decades. Her grandmother had to move in with her son and declare bankruptcy – to Nicole, it didn’t feel like a fitting end to an American story. This story reflected something we had been finding: healthcare is a major issue for almost everyone we talked to. I found it powerful that Nicole is meeting these dark times with hope and action. Saddled with mounting loans as she puts herself through college, she says "I can&apos;t pay my grandma&apos;s medication bills, but I can get active and try to elect a president who cares about people like my family." Family is very also important to them, and they look at the Obama family and they see the way they interact. To this family in Mansfield, something feels right about the dynamics of Obama’s family, and these are people that they trust. I have a shot of the whole family out in front of their house, just passionately talking about how they’re voting for Obama. There are people being laid off around them, and many families around them are dealing with foreclosures. What will make or break if this ad can get out on the rural Ohio ad market is how much money we’re able to get in donations over the course of the next day or two. LAist: Where are these ads being rolled out, and what’s the gameplan for them? Alicia Dwyer: Local Voices for Obama has ads playing in Missouri (currently in Joplin and surrounding areas), Nevada (currently in Fallon, and in the coming week in Reno, Carson City, Springfield and surrounding communities), and Ohio (Columbus area). All the ads featuring local people in these states are featured on the Local Voices for Obama blog. Radio campaigns will also be rolled out this week in these regions as fundraising permits. Local Voices is planning to supplement the buys with Network Broadcast buys dependent on fundraising too so that folks watching Fox can see Local Voices ads too. LAist: Until when can people donate money if they’d like to, and where to? Alicia Dwyer: Well, people can make donations online at the Local Voices for Obama website and blog. In order to support our cable television advertising, donations need to be received over the next 2-3 days ideally. Ad buys can be made after that, but the earlier the better. LAist: What’s the sense for after the election? Alicia Dwyer: The sense is that we have something that’s working very well. Yes, everybody working on Local Voices for Obama needs to go back to their jobs. But what we’re all sort of hoping is to build a better world, and to possibly mobilize again to do this kind of video work when there are other issues that speak to us in the future. You know, during this election season, I started making phone calls and going to neighbors, I put lawn signs up. But I really wanted to use the unique skills that I have. I’m a documentary filmmaker. This is what I do. I film stories about people in their real lives. I found a group of people who are doing what we do as a way of enabling these brave Obama voters in red areas to speak plainly with their neighbors about the things they have in common and the things they care about. And that’s the power of telling stories. I could use my skills in storytelling to further real conversation about the issues of this election. And I’ve never directed a commercial in my life! As for Local Voices for Obama, it&apos;s a Political Action Committee (PAC). That’s like the Swift Boat People! I NEVER thought I’d be this involved with a PAC. But this is the kind of thing I could get behind. Because we’re not trying to incite fear. What we’re doing is giving people the tools to open up this discussion in their communities in an interesting way. And this has been a common theme among people around the country this election season – using their skills to move issues and candidates forward. It’s beautiful. Videos above from Local Voices for Obama. Photos above courtesy of Alicia Dwyer. 1st photo: Alicia and Michael Dwyer at work. 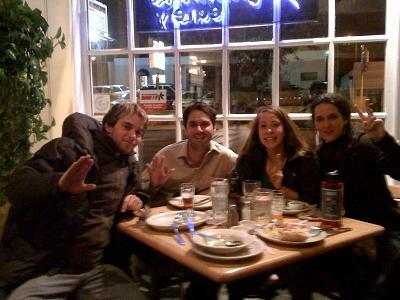 2nd photo: Michael and Jesse Dwyer, Katie Roper (who connected Alicia to Ohio voters) and Alicia Dwyer, at a restaurant in Ohio.